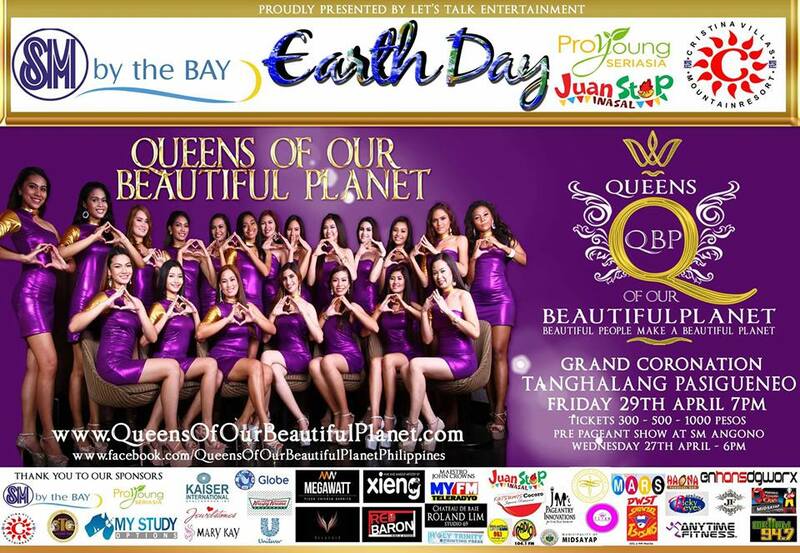 Queens of Our Beautiful Planet Philippines 2016 is a new beauty pageant with candidates across the categories of TEEN, MISS, & MRS/MS. Focusing on both inner and outer beauty with promotion of community spirit, and social responsibility. The coronation night will be held on April 29, 2016 at Tanghalang Pasigueño in Pasig City. The pageant is composed of three (3) categories - Teen, Miss & Mrs.. Winners will be sent to international competitions such as Teen/Miss/Mrs. Planet, Model of the World, Bride of the World amongst other titles. The main titles - Teen/ Miss/ Mrs. Queen of Our Beautiful Planet which will have its world finals in Yancheng, China this coming September 2016. The pageant has an important segment on advocacy dubbed as KINDNESS IN ACTION (KIA) - GLOBAL CAMPAIGN. Candidates took part in the celebration of the International EARTH DAY held on April 22, 2016. Mrs Planet Philippines - will represent the Philippines in Bulgaria at Mrs Planet. Miss Planet Philippines - will represent the Philippines in Europe at Miss Planet. Miss Progress International Philippines - will represent the Philippines in Italy at Miss Progress International. Miss Model of the World Philippines - will represent the Philippines in China at Miss Model of the World. 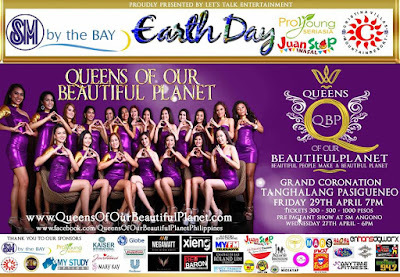 Miss Teen Beautiful Planet Philippines - will represent the Philippines and compete at the international final night of QBP. Miss Teen Planet Philippines - will represent the Philippines in Bulgaria at Miss Teen Planet. Who will be the next QBP Queens to represent the Philippines on the international stage in Teens, Miss & Mrs/Ms.